Pop/Pistol, 1990 Oil stick & charcoal on paper, 63 x 50 inches. Courtesy of DC Moore Gallery. Whitfield Lovell’s (A’81) loft feels like a sanctuary from the hectic pace of life in New York City. The smell of freshly sawn wood pervades the space, and light seeps in through the windows. His various collections—everything from statues, globes and paintings to glass bottles and antique tintypes— adorn walls and the tops of furniture. In this environment, time itself seems to slow its stride. His studio, which sits in the middle of the loft, is lined with both finished works and works in progress. All of them center on extraordinary portraits of people from bygone eras. Some of these life size portraits are charcoal on paper, while others have been meticulously drawn onto wooden wallboards. One woman, a slight smile on her lips, looks directly at the viewer. Spread across two planks of wood, a handsome soldier from the 1940s directs his gaze toward something in the distance. His legs sprawl lazily beyond his chair, his eyes and mouth are serious; his thin mustache emphasizes his youth, though he might have grown it to seem older. On the floor of the studio, several old wooden foundry molds stand on their sides, so their circular faces are upright. The marks left on the molds through years of use seem an integral part of the portraits that have been drawn on them. The beauty of the drawings pulls you in for a closer look and, up close, the people portrayed silently invite you to wonder who they were and what their stories might have been. The observer cannot just look at the work; the viewer is drawn into active participation. Lovell himself also gives off a feeling of calm, of gentleness. He moves slowly and thinks carefully before he speaks. He has a spontaneous and jovial laugh. It hardly comes as a surprise that this man is the creator of this world and of these portraits. Both are the result of the confluence of Lovell’s particular family history within American history. Born in 1959 and raised in the Bronx, Lovell realized early on that he wanted to be an artist. When he was a boy, one of his teachers recognized his great talent for drawing and tutored him at lunchtime. After school, he would spend hours drawing. His father, an amateur photographer, brought Lovell, starting from the age of five, into the darkroom to help him. This mix of experience—family portraits with his father, and the hours spent drawing—led him as an adult to focus upon images of his family and then later to create portraits that are drawn from either formal photographs for which people sat or, alternately, mug shots and informal pictures from photo booths. The images are of African Americans whose names have been forgotten or lost, dating from between the time of the Emancipation Proclamation in the late 1800s and the Civil Rights era: history, an absence of knowledge and a desire, almost an obligation, to remember form the crux of much of his work. These aren’t just notional interests. Lovell’s family and his own personal experiences have time and time again brought him to these themes. Lovell’s mother was originally from South Carolina. His father was born in the Bronx, and his parents came from Barbados. Lovell was very close to his maternal grandparents, and traveled with them every summer to South Carolina to see family. His great-great aunt lived in a wood cabin there, with no electricity because she didn’t like its excessive brightness. “Most of my work comes from my closeness with my grandparents. They were my conduits to another generation,” he explains, and that time and place figure heavily in his art. He based the cabin in his installation piece Whispers from the Walls (1999) on his great-great aunt’s cabin. When visitors first entered, they could hear an old scratchy blues tune played on a phonograph. In order to enter the cabin, which was placed in the center of the University of North Texas Art Gallery, people had to first walk over clothes strewn thickly on the floor. Then they had to walk on mulch, before finally arriving at the front door. There, they would enter a shadowy bedroom filled with the odors given off by an old-fashioned whiskey filled decanter and an oil lamp. There were little bedside tables with ordinary clutter—eye glasses, mirrors, hairbrushes and a few coins, for example. Whispered conversations—not loud enough to be understood—could be heard. On the walls, in the shadows, were a few charcoal portraits. By contrasting the solidity of the experiential with haunting images, Lovell makes absence palpable. By asking us to witness it, to interact with it, he gives those who are absent or unremembered a clear voice. His family’s history, of course, is set within the wider context of American history. 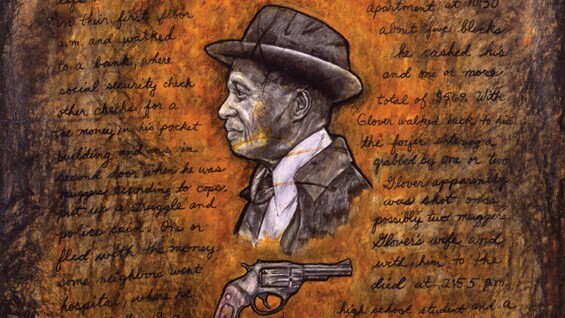 While race and politics are not and should not be seen as the main thrust of Lovell’s work, these topics affect his art because of their impact upon his life. In the spring of 1968, when Lovell was eight years old, Martin Luther King Jr. was assassinated, and it was at this point that his parents sat him and his siblings down and talked to them seriously about race in America. This greatly affected his development as a person, as did subsequent experiences. For example, remembering took an intensely personal turn for Lovell when he was a young man: within a five-year period, he lost his older sister, his maternal grandfather and his paternal grandmother. Remembering African Americans forgotten or ignored by American history, for Lovell, is a natural progression for him in his exploration of memory, history and loss. “I never started out with an agenda,” he points out, “I never set out saying ‘what can I do for African American history?’” Politics affect the images at a remove and as a by-product of their existence within the thorny framework of race in America. Politics once again made an appearance during an artist’s residency outside Milan. The owner of the villa he was staying in conversationally mentioned that the villa had once belonged to an Italian slave trader. His coat-o farms, in fact, included an image of an African face, replete with a bone through his nose. This was when Lovell started to draw on walls. “I felt like making a statement about being in this place. I wanted to leave a dignified image of a black person who had been there,” he says and so he put his self-portrait on the wall. This convergence of personal experience and a wider history also led Lovell to another motif in his work. One series of his juxtaposes portraits with playing cards that he had found, while another depicts hands, palm facing us, where he has positioned a person, sometimes known to him, some unknown. Both the hands and the cards are strong visual images, though they are on a more intimate scale than the life-size portraits. They suggest that fate or destiny can’t be avoided. The hands have even more symbolism for Lovell. “I went to Morocco in the mid-1980s and I bought my first Hand of Fatimah; that led to me collecting them and drawing them,” he explains. “The hands are a symbol of protection in many cultures, as well as symbols of power. By putting people in the hands, I was thinking of protecting their memories, and getting a sense of power from the past.” The protection and power derived from remembering echo through his art, in the depictions of family members he has lost, and through his life, in terms of understanding his past. Understanding the past is something Lovell feels we all need to do. While American history might provide the backdrop for his work, Lovell means for his images to transcend: “My work has to say something about the human experience,” Lowell says. “You look at a photograph of somebody, and you realize that this person was alive, and they were making changes, and influencing each other, nurturing each other. Their lives were just as meaningful to them as ours are to us now.” He pauses. “And they’ve all passed on. And one day, it’ll be us. Train and installation view, 2006, Courtesy DC Moore Gallery. Somebody will be looking at photographs of us. And, I think that understanding today and in the future is possible only if we know where we came from, and what it took to be here.” Since graduating from Cooper Union in 1981, Lovell has exhibited extensively both in the United States and internationally, and in 2007 he received a MacArthur Foundation fellowship award. His work is in the collections of the Whitney Museum of American Art, the Studio Museum in Harlem and the Metropolitan Museum of Art, among many others. In New York, he is represented by DC Moore Gallery. In recognition of his many accomplishments, the Cooper Union Alumni Association honored him this year with the 2008 Augustus Saint Gaudens Award in Art.